For the crust, I used this easy recipe for sweet galette dough adapted from an article David Lebovitz wrote for Fine Cooking magazine. I love that you can make it in a stand mixer, food processor, or just a pastry cutter. Basically, you combine the ingredients and mix just until the dough comes together. Dough-making wisdom from David: "For the best results, don't cut the butter too small. Leave it in big, visible chunks—sugar-cube size is fine. You'll see streaks of butter when you gather the dough into a disk, but don't be alarmed. In the oven, those streaks of butter help to create light, flaky, buttery layers." While the dough chills for an hour in the fridge, you can prepare the strawberry and rhubarb filling. Divided, the two balls of dough make tarts about 8 to 9 inches in diameter, the perfect size for baking in half sheet pans and traveling in these very handy plastic "bakery boxes", which I originally bought for transporting dumplings. I toted the two tarts on the subway and (I think) got at least a couple jealous looks from other G train riders hungry for dessert. Cut in the chilled butter using a stand mixer, food processor, or pastry cutter, until the butter is mixed in but large pieces are still visible. Add the ice water. Mix just until a dough forms (it's easy to overmix when using a stand mixer or food processor.) With your hands, shape the dough into two disks. Cover with plastic wrap and chill in the fridge for 1 hour. 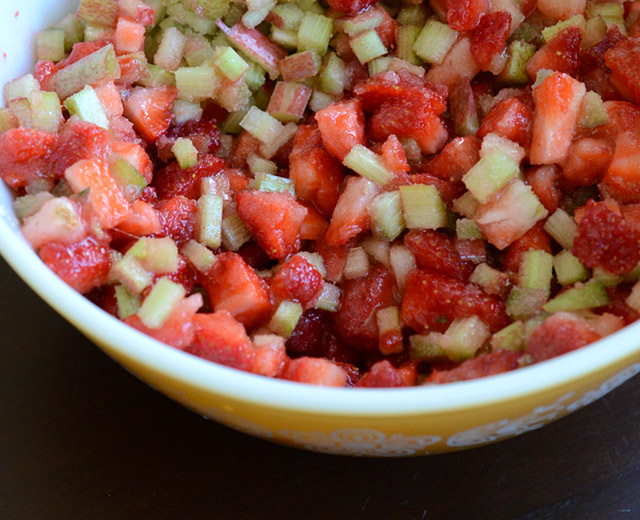 Meanwhile, prepare the filling: In another large bowl, combine the strawberries, rhubarb, and sugar. Let sit for 30 minutes to macerate. Once the dough has chilled for 1 hour, remove from the fridge and unwrap. Using a rolling pin, roll each disk out on a clean, lightly floured surface until each is about 14 inches wide. Spoon the filling into the centers, dividing the filling equally between the two galettes. Fold the edges over the filling and pinch the edges together. The galettes should end up being between 8 to 9 inches in diameter. Place the galettes on a sheet pan lined with parchment paper. Bake for 50 to 55 minutes, until the crust is lightly golden. Remove from the oven and cool for at least 20 minutes before digging in. Sweet Galette Dough recipe adapted from Fine Cooking Magazine.